In July last year, my husband and I went to a trip to El Nido. We were supposed to be in a group of 6, but only the two of us decided to go ahead. 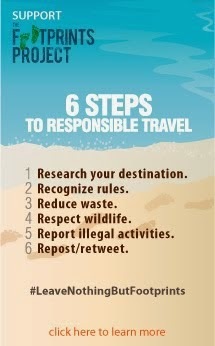 So, how much did we spend for this trip? 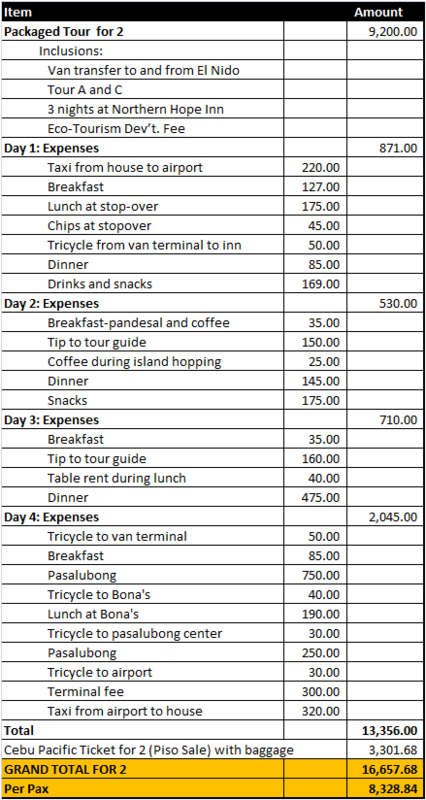 I think before I continue with my posts on our very recent El Nido trip, I should give you a list of how much we actually spent on this trip, so below is the list. It came out to P16,657.68 including airfare bought during the Piso Sale and including the pasalubong. 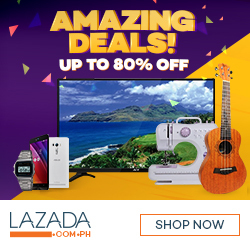 If without pasalubong, it will amount to just about P7,800 per person. This is such a great budget trip! I bought some snacks already such as cup noodles and some chips on our baggage but we still ended up buying more since we love snacking. Our dinner didn't cost that much except for the last night because we only eat in small restaurants or eatery except on our last night when we dined by the beach. Since there were only 2 of us, we also didn't spend too much on social drinking and we just opted to buy and drink in our room. Besides, the rain was pouring and it was much fun to hang out in our room. If we were with our usual set of friends, maybe we would have each spent maybe P1,500 more on food, but we will spend less on accommodation because it will be a shared cost (we paid P2,400 for 3 nights). But that would still be below P10,000 per person. I really consider this a very successful budget travel because I never thought that I can go to El Nido on such a small budget, considering that there were only two of us. And this is El Nido, where rates at luxury resorts are at P24,000 a night, on a low season like July. And with the view in the picture above, this was a steal!